The most recent addition to this page is a comment from Dean Whitlock about shooting with a missing middle finger, and a friend who is completely missing a hand who was the New Hampshire archery champion two years in a row. Scroll down for his story. Before the Battle of Agincourt in 1415, the French, anticipating victory over the English, proposed to cut off the middle finger of all captured English soldiers. Without the middle finger it would be impossible to draw the renowned English longbow and therefore be incapable of fighting in the future. This famous weapon was made of the native English Yew tree, and the act of drawing the longbow was known as "plucking the yew" (or "pluck yew"). Much to the bewilderment of the French, the English won a major upset and began mocking the French by waved their middle fingers at the defeated French, saying, "See, we can still pluck yew! "PLUCK YEW!" Over the years some 'folk etymologies' have grown up around this symbolic gesture. Since 'pluck yew' is rather difficult to say (like "pleasant mother pheasant plucker", which is who you had to go to for the feathers used on the arrows for the longbow), the difficult consonant cluster at the beginning has gradually changed to a labiodental fricative 'F',and thus the words often used in conjunction with the one-finger-salute are mistakenly thought to have something to do with an intimate encounter. It is also because of the pheasant feathers on the arrows that the symbolic gesture is known as "giving the bird". Paul Atkinson of the UK writes: "The battle of agincourt actually bought about the two fingered salute, as it required two fingers to draw. Its a widely known and accepted fact within re-enactment groups and historians alike (falling into both categories I know). The Pluck You however is unconfirmed. M. Savate Writes: I read with interest the article on the origins of "pluck yew." While doubtful of the origins of the saying, I do know that while traveling in Great Britain, I was cautioned on the difference between the "peace" and "victory" signs as made using the index and middle fingers. With Americans there is not a particular difference in meaning, not so with the Brits. Holding up the fingers with the knuckles exposed to the person one is gesturing to is an incredible insult, akin to "pluck yew" or "wanker." The origin of the insult (as explained to me) stems from the English longbowmens prowess and accuracy. As punishment to the longbowmen, the French, when they could capture defeated English archers, cut off there index and middle fingers, effectively ending their profession as archers. 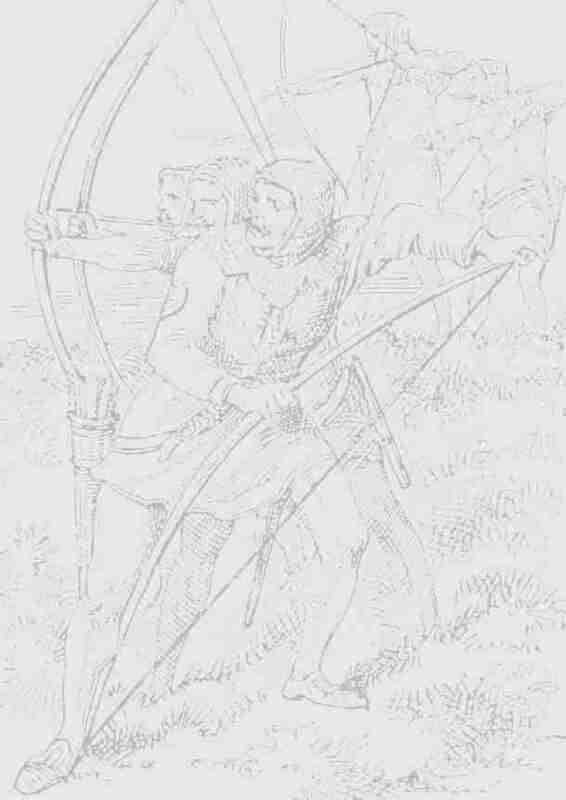 As an insult to the French, non-mutilated English archers would hold up their two fingers, knuckles out, in a taunt, indicating their abilities remained intact. Mike Brampton of the UK writes: I would like to add to the comments made by Paul from the UK and to correct some of the terminology from M Savate. The two fingered salute as stated seems to come from the gesticulation and waving of both fingers showing knuckles towards the French although it is not as far as I'm aware documented that the French ever cut off the fingers of English longbowmen. It would be nice to think they never caught any! This is similar in meaning to the bird except it normally signifies --ck off rather than the --ck you of the "bird"
I managed to chop off the ends of the ring and middle fingers of my right hand 20 years ago or so (got careless with a joiner). I've discovered I can shoot arrows just fine, even though I pull right-handed. I still have the lower joint, first knuckle, and a stub of the second joint on each finger, which gives me some grip. I hold the arrow with the stubs of ring and middle, rather than index and middle. The only problem is a lack of callous, which would build up quickly enough during consistent practice. Based on my experience, I reckon a good archer who was missing the entire middle finger could easily shoot using index and ring finger. For the French strategy to be effective, you'd have to remove more fingers. On the other hand (;->) I also know someone who was completely missing his right hand but still became the archery champion of New Hampshire two years running, even though he was right-handed. He had a special hook made to hold the bow and pulled with his left hand. So an archer who lost fingers on his right hand could switch to pulling left-handed, as long as there was enough finger remaining on the right hand to hold the bow firmly. After working with a one-handed archery champion, losing a couple of fingers seemed like a small problem. The hardest daily chore is taking change - it falls out through the hole in the middle.